Song details - PALO! 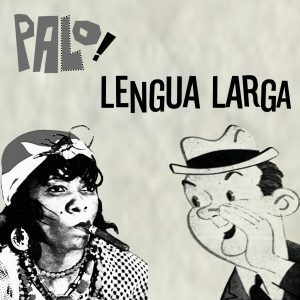 - Afro-Cuban Funk Band - "Lengua Larga"
The idea for “Lengua Larga” happened in a typical way for us. I discovered that a friend of ours could not be trusted with a secret. Some people think this song is about a woman. Do they assume that “el chisme” (gossip) is only female territory? This song was written about a man. ¡Chismoso! Leslie and I landed on the title “Lengua Larga”. What fun tossing around phrases for the coro! I love the kind of unison vocal melody that is typical of classic Cuban congas. So we tried that and it worked right away. In about ten minutes we had the chorus done. It didn’t take long to complete the song. The entire melody and lyrics were finished in about an hour. The arrangement came about without much thought. But my musical influences are always just below the surface. One of the first parts I added was the clavinet riff, a tip of the hat the great Herbie Hancock. My brother, David Roitstein, introduced me to the funky Herbie records in the 1970s. I’ve loved them ever since. Also, the Miami Sound has always influenced me. An example of that are the simple trumpet chords in the chorus of the song remind me of something that my friend Mike Lewis might have written for a KC and the Sunshine Band song. Growing up in Miami, that music was all around me. Leslie’s vocal delivery has the perfect amount of edge to it. She sounds like she’s getting fed up with this guy! The interplay between Leslie and Ed as the song climaxes is one of my favorite moments on the album. It seems like this song is a bit more funk than latin. The cool percussion vibe that Philbert and Raymer put on the song fits it like a nice, comfy pair of well-worn jeans. After we released the music, we needed a video. We decided to do the video for this song with our friend, director Rubén Abruña. We shot the video in the now-defunct Kimbaracumbara in Little Havana, where PALO! had a monthly residency on the third Friday of every month.